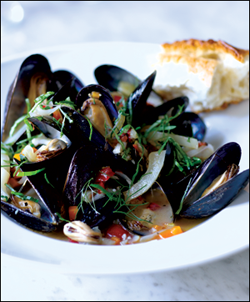 This punchy rendition of mussels in white wine offers a quick course on several cuts: slicing, dicing, mincing, and chiffonading. Serve the mussels with crusty bread for dipping into the peppery tomato broth, or ladle the mussels and broth over hot linguine. When buying mussels, ask the fishmonger for a bag from the refrigerator in back, which are often fresher than those in the front display. Trim the stalks from the fennel and cut a thin slice off the bottom; then core and cut the fennel into 1/4-inch crosswise slices (see page 119). Put the fennel into a large bowl. Cut the onion crosswise into ¼-inch semicircles (see page 95) and add to the bowl. Peel the carrot and cut into 1/4-inch dice (see page 109) and add to the bowl. Peel and mince the garlic (see page 100) and add to the bowl. Core the tomatoes. Cut them in half through the equator and squeeze out the seeds. Cut them into ¼-inch dice (see page 127) and put them in a separate bowl. Cut the basil into chiffonade (see page 133) and reserve for the garnish. Lightly crush the peppercorns and fennel seeds in a mortar and pestle. (Alternatively, put them in a small self-sealing plastic bag. Using the bottom of a cast-iron skillet, lightly crush them. Transfer the spices to a small dish.) Add the salt and red pepper flakes. Set aside. Heat the oil in a heavy 6-quart or larger stockpot over medium heat. Add the fennel, onion, carrot, and garlic, and sauté, stirring occasionally, until softened but not browned, about 5 minutes. Stir in the spice mixture. Add the wine and the tomatoes along with any juices in the bowl. Bring to a boil. Add the mussels to the stockpot (don’t stir), cover, and steam until the mussels open, about 5 minutes. Scoop the mussels into individual shallow bowls, discarding any that remain closed, and then spoon some vegetables and broth over them. Sprinkle each bowl with basil and serve immediately. If you’re braising or roasting fennel wedges, leave the core intact so it holds the fennel together. But for slicing or dicing, do cut away the core first. Lengthwise slices emphasize the vegetable’s tough and fibrous quality. Crosswise slices are more tender and juicy, and better for salads. 1 Cut off the stalks close to the bulb (save the fernlike fronds for a garnish, if you want). Trim off the hard base. If the outer layer isn’t too blemished or fibrous, leave it on. Otherwise, remove it and discard (or save for stock). 2 Cut the bulb into lengthwise quarters. Stand up one quarter on its base, or let it rest on the rounded side, and cut away the core. Repeat with the other three pieces.